Christmas — Some celebrate the day as a holiday for presents and feasting. For others, Christmas commemorates the birth of Jesus of Nazareth, honored by Christians as the Messiah. On that first Christmas, angels appeared to shepherds (talk about a light show), and a few weeks/months later wise men appeared with gifts. Such diversity of celebration has existed since the first December festivals. 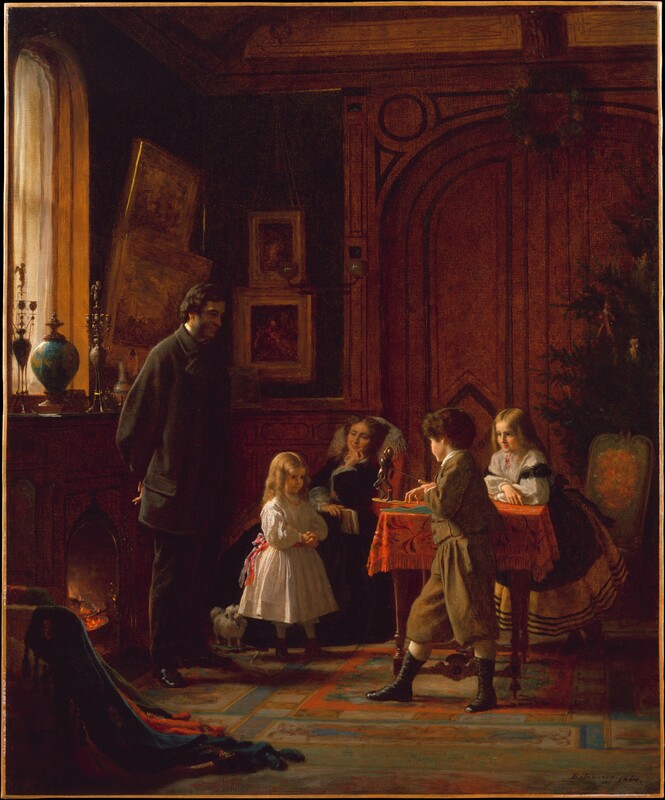 The American Christmas was born from Charles Dickens’ A Christmas Carol — decorated trees, presents, and a memorable feasts. More than these, Christmas became a day shared with family and friends. The best way to watch Christmas develop during the 19th century is through media, beginning with a nursery rhyme. Christmas is a time for joy, but also for remembering that not every has a “penny” to spare. Now, on to our holiday. This is the first American picture of Santa Claus, drawn by Thomas Nast for publication in the January 3, 1863 edition of Harper’s. The title: A Christmas Furlough. 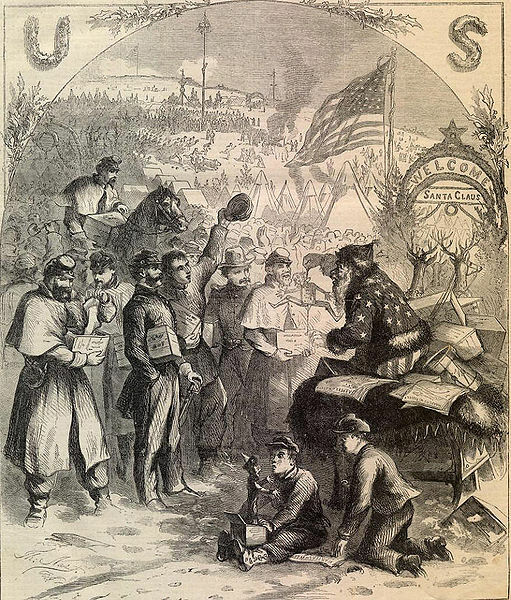 Santa sitting on his sled with only two reindeer is passing out gifts to Union soldiers, and the boys at the front who seem to have a jack-in-the-box. Santa is patriotic and wearing a modified flag — striped trousers and stars on his jacket. 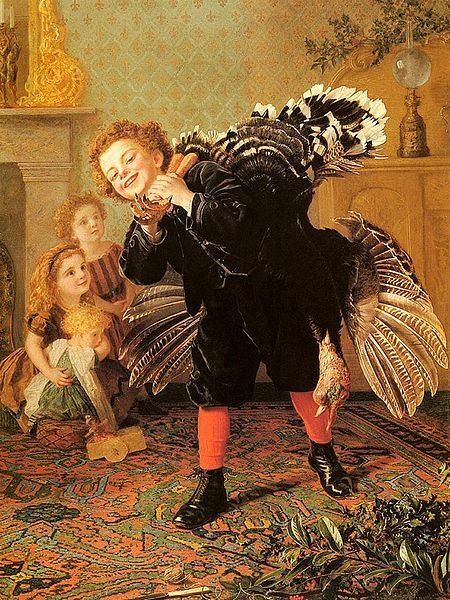 The next picture is called Christmas Time Here Comes the Gobbler painted by Sophie Gengembre Anderson. What a lovely room — what a magical turkey. He is too polite to splash a single drop of blood on that ornate carpet. A kid’s view of an excellent Christmas — Big brother supplies the bird. Little sisters watch in awe, and baby has a pull toy. The cynic in me wonders how long it will take to dress and cook the bird. Will it be ready in time for dinner? What would Christmas be without holiday songs? 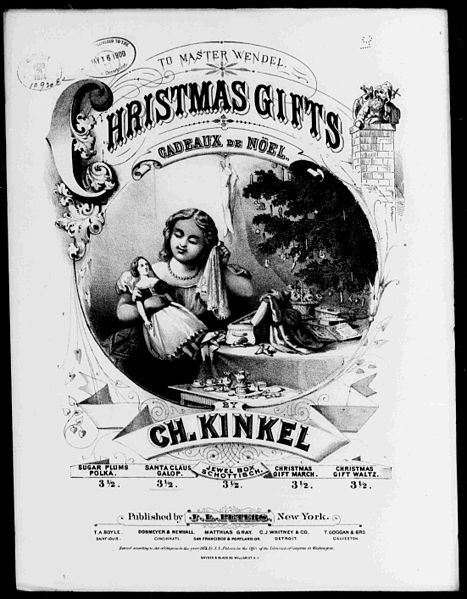 This cover on the sheet music for Charles Kinkel’s Santa Claus Galop is rich in meaningful holiday cheer. Note Santa coming down the chimney on the right hand side. It’s been ten years since he gave out gifts to the troops. Fortunately he has not gained any weight, ‘cuz that chimney looks a little narrow. Note the French phrase Cadeaux de Noel — this is classy stuff. It translates to “Christmas Gift.” The young girl has several, including the lovely doll she holds. A “galop” by the way was a lively dance popular at the time. 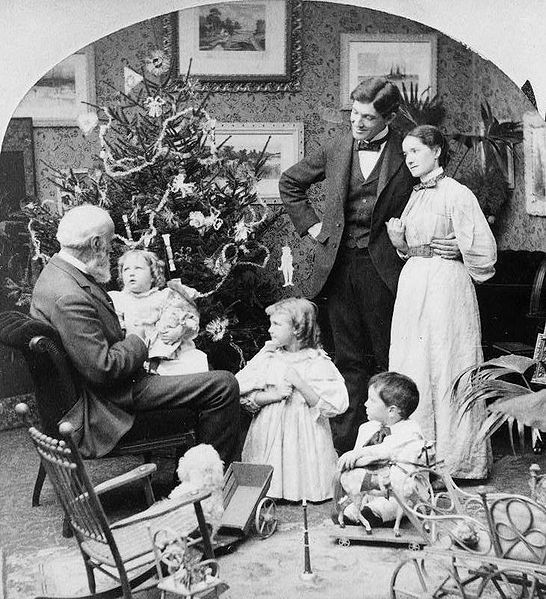 Our last picture, a photograph by Griffith & Griffith in 1897 depicts a Christmas scene many American grew up with — aside from the clothes and interior design. But the tree looks familiar — a bit higgily-piggily, decorated with love. Doting parents — no doubt wondering how long they have to hold the pose. Grandpa has it easier, enjoying his chair and looking away from the camera. The kids have a flash-frozen look, but it’s a happy scene. And there are toys, toys, toys — a child size chair, a doll size chair, a baby buggy, a rolling horse for the young man of the house. Middle class Americans had a good life in 1897. This is the picture of family life that inspired Americans, regardless of their economic condition. It depicts the abundance of Christmas that we still want today. Every American wants to have enough to support his or her family. We want our children to have what they desire. We want our families to be together. This may not be the way things are, but it is what most Americans have as their Christmas wish. I hope that your Christmas wishes come true and that you continue to dream of a future in which families everywhere can live in peace.